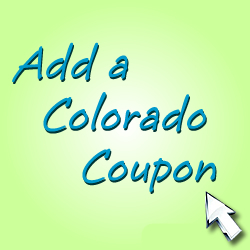 Colorado Coupon Guide – Promotes Colorado business by offering Coupons and Discount Deals to businesses, services, and products from across the beautiful state of Colorado. Adding a Coupon or deal to Colorado Coupon Guide is an easy way to help promote your local Colorado Business, Service, or made in Colorado Product. When you add a Coupon listing to the Colorado Coupon Guide, your Colorado Coupon Ad appears on this website, and also across a wide network of Colorado promotion websites and social media outlets focused on supporting local Colorado communities as well as the economy of the entire state of Colorado.